I’ve always had an interesting time in New Orleans. Been there three times. The first time, with Ryno, just six weeks after Katrina. I still think about that afternoon driving through the town. The destroyed buildings and piles of rubble. The cars with the “water lines.” Doors with those haunting spraypaint bodycount markings. Such an incredible, sultry, unique city on its knees. Every now and again I look up New Orleans to check on its rebuilding and progress. And I’ve visited a couple times since. A year after Katrina, and then a couple summers back, just before the World’s Longest Yard Sale. The town is coming back. Slowly, sure, but it’s coming back. And was reassuring to see it thriving. The rest of the state? Not so familiar. Drove down diagonally from Shreveport to New Orleans once with Dale. Saw signs for Angola, making me shiver. I’ve had a number of folks tempt me with speaking gigs in New Orleans, and greater Louisiana. But the first one that really made it happen was Louisiana Tech, and one Tom Futrell. Had a helluva visit there! Great talk and cool kids. Thanks, Ruston! And like all my gigs, I want to show up with something for them, and something for the state I’m going. Hope you guys dig the new “Vive La Lousiane” poster. Everything we’ve ever loved about our travels through it, lore, heroes, the people, the food and spirit. Long Live Louisiana! 01. Printed on thick, durable, bright, white 100# cover stock. 02. Four colors! Inspired by crawdads and New Orleans French Quarter nights. Check out that metallic gold! 04. Proudly printed by the bead-throwers over at Seizure Palace, just a couple blocks from our shop here in Portland, Ore.
05. 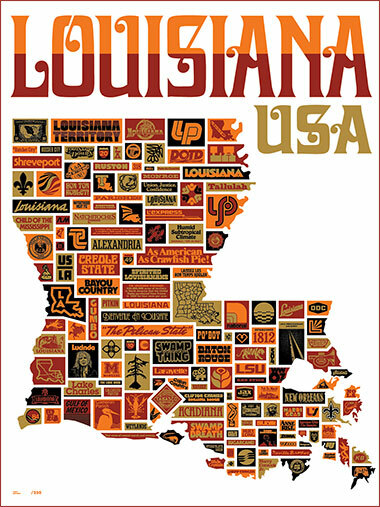 Louisiana, get nasty with this one: Click here for a bigger view. 06. Does the job for that New Orleans French Quarter vampire lair. Or that Ruston classroom. Or that cajun swamp hideout. Or that Alexandria zydeco dancehall. Or that Baton Rouge riverboat sleeping quarter. Or the cockpit of that coastal shrimp trawler. Or that Shreveport lean-to. We gare-ohn-teee. 07. Dedicated to the those lost, relocated and affected by Katrina.